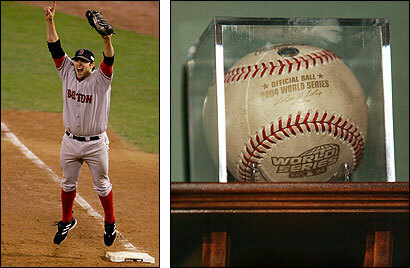 At left, the ball rested safely in Doug Mientkiewiczs glove in 2004. The baseball (right) that is the subject of the Red Sox legal dispute, on display at Fenway Park in February. To Red Sox fans, it is priceless -- the baseball that Keith Foulke flipped to Doug Mientkiewicz on an October night in St. Louis last year to clinch the team's first World Series championship in 86 years. Now, 13 months after Mientkiewicz pocketed the ball, the team is playing hardball. Lawyers for the Red Sox filed suit yesterday in Suffolk Superior Court seeking permanent possession of the cherished symbol of suffering redeemed. When the team first tried to claim it, the light-hitting but slick-fielding first baseman created a furor in Red Sox Nation by refusing to give it up. In January, days after he was traded to the New York Mets, he and the team announced that the Red Sox would hold the ball temporarily and could display it across New England, along with the World Series trophy. But the agreement said he would get it back at the end of this year ''unless the ultimate issue of ownership has been otherwise resolved." That clause led Red Sox lawyer John G. Fabiano to the Suffolk civil clerk's office yesterday. The suit asks the court to place the ball in a ''secure location" until ownership is decided. The club's legal team said that Mientkiewicz had gained possession of the ball only because he was a Red Sox employee and that the ball remained the team's property. He played for the New York Mets last season, then was released, and is now a free agent. Neither Mientkiewicz nor officials at the Major League Baseball Players Association could be reached for comment last night. He has said he never expected the controversy surrounding the ball. Similar famous baseballs have fetched six figures in auctions. But the Red Sox insisted that money has nothing to do with the fight. ''From our perspective, it is very important that an artifact with this much history -- it was 86 years in the making -- be part of the club archive and be available for fans to experience," Lucinda Treat, the team's chief legal officer, said in an interview. Other disputes over ownership of historic baseballs have led to lawsuits, including a fight between two fans over Barry Bonds's record-setting 73d home run in 2001. But Treat said she was aware of only one other case where a team has sued a member of the organization over a memento -- the Baltimore Orioles lineup card in the 1995 game when Cal Ripken Jr. broke Lou Gehrig's consecutive-games-played streak. The Orioles and former manager Phil Regan reached an out-of-court settlement that allowed Regan to sell the souvenir. Mientkiewicz drew support from some sports fans in Boston. Andy Papertsian, owner of Bay State Coin Co., which sells sports memorabilia such as autographed baseballs in downtown Boston, accused the team of breaking its word and called Red Sox management ''small minded." Papertsian said the team would never have sued Mientkiewicz if he had been a star and had not left after the 2004 season. But Treat dismissed such suggestions. ''It has nothing to do with who the player was or anything of a personal nature," she said. ''It's all about a treasured, historically significant item." Papertsian said the ball would certainly fetch a princely sum on the open market. ''There's always one person out there willing to pay a ridiculous sum for something like that because he'll have the only one of it," he said. The ball that went between the legs of Sox first baseman Bill Buckner in the 1986 World Series was ultimately bought by actor Charlie Sheen for $93,500. In 1999, former Cincinnati Reds left fielder George Foster came forward with the ball that Sox catcher Carlton Fisk hit off the foul pole in Game 6 of the 1975 World Series. That sold for $113,273. The priciest ball of all time is the one hit in 1998 by St. Louis Cardinal slugger Mark McGwire for his record 70th home run, selling for $3 million. Brian Demers, a 42-year-old Red Sox fan from Needham who works in the telecommunications industry, said the whole flap was silly. ''Although the ball may have some historic value, I don't think it's worth fighting over," he said. ''At the end of the day, they won the World Series."